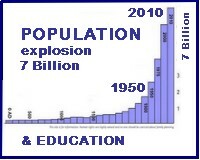 Rescue The World.net provides info on a Sustainable Planet, like Bio Capacity, Climate, Water and rapid Population growth … Education & Solutions are highlighted. Business as Usual: + 10 deg F by 2090. But more digging uncovered many ugly “Earth Worms” – Statistics that are impossible to ignore, like the ones below. As hard data sinks in, turn to some of the proposed Solutions. 17% of energy from renewables like solar and wind. Hurricanes have doubled in number and intensity since y2000. 4 Planet Earths are required for a western lifestyle. accelerate at a serious pace. … Critical overview of a sustainable planet. Images tell the story at a glance. Browse for an overview. 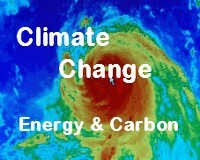 Sources and links are given for hard data on rising energy use, carbon, temperature, hurricanes and drought. 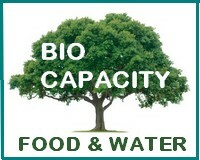 Biocapacity is explained as a measure of world wealth. Education and human rights are seen as important paths to a sustainable world. Nuclear power is considered, as an alternative to fossil fuels, and nuclear is compared to renewables. Extracting critical global data took 3 years – a main goal of this site is to make the results easy for people to access. Acquire a world view. It allows search for US candidate positions on climate change and carbon tax and dividends, by state or by zip code. Vote Climate in 2020 . 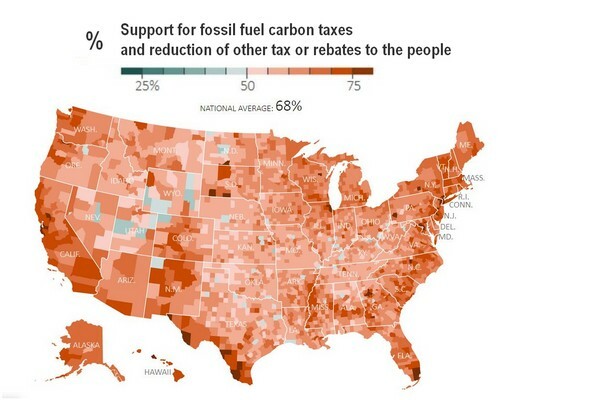 There is majority support for carbon fees and dividends to reduce fossil fuel use. Why don’t politicians “Get It”? 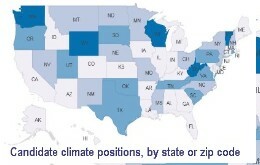 Source: Yale University Vizualization on Climate Change. in the Policy Support section. MAP SOURCE – DOWNLOAD: Global Climate Change Impacts on the US, report by 13 United States Government science bodies. Graphs are on page 29. Yes, that’s an average 10 deg F. temperature increase by the end of the century. -> Open Acrobat Reader before opening the file. 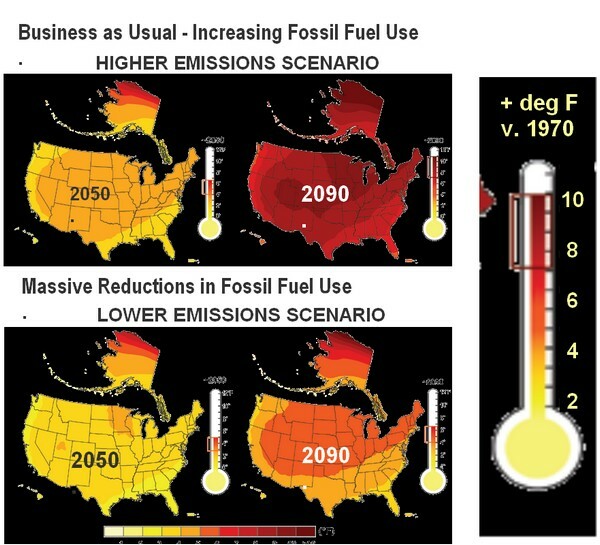 Business as usual is the Higher Emissions Scenario at the top. It throws the world straight into temperatures of 3 million years ago, by mid-century, never before experienced by humans. The world was hot and inhospitable then. By the end of the century, temperatures are like those of 50 million years ago, the last great extinction event, at + 10 deg F. Palm trees were growing in the arctic swamps at that time, and most of today’s coast lines were 600 feet under water. The geological age analysis is from a ground-breaking study: Pliocene and Eocene provide best analogs for near-future climates, by K. D. Burke et al, published in Nature.com. Per the authors, a significant finding of the study is: “The expected departure of future climates (differ) from those experienced in human history (and) challenge efforts to adapt”. An understatement of the planetary danger. Download a copy of the original IPCC 2018 Summary to Policy Makers. It is a short, but fairly dense document, with technical descriptions that may not be accessible to readers who are not climate scientists. Like most Policy Makers. The IPCC report states that there are only 12 years remaining to cut CO2 emissions in half, before existing damage from climate change really goes off the charts. It also says that: (a) climate change is human caused, via fossil fuel emissions, and (b) as a result, extreme weather is amplified, and lives and resources are destroyed. Non-profit: RescueTheWorld.net has been created as an Educational website. It has no commercial objectives. The work is a volunteer, non-paid retirement project and the motivation is to share critical information. Any funds raised for women’s education (in the solutions section) will be transferred to schools on-the-ground in least developed countries, in their entirety. Browse for an Overview: Not everyone will want to investigate all of the sources referenced by RescueTheWorld.net; that would be 1,000s of pages of reports and many 100s of hours of reading! Explore areas of personal interest, and try to browse the whole site, to absorb the storyline of global risks and potential solutions. It may only take an hour or two to find startling new facts. Links to Data Sources & Organizations: Many of the organizations referenced have ways for people to support them financially or by volunteering time and effort. Please participate as you can.. Visit the Sources and Links page, for access to Rescue The World.net site-wide data sources via original global reports. Invite Others to RescueTheWorld.net. Please ask other people to visit this website, to gather information they can consider. 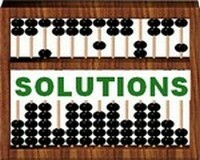 There is a Solutions page that recommends some concrete actions, but if those solutions don’t appeal, that’s OK. Good information can lead to new solutions.